Rothco Olive Drab Medic Bag Messenger Shoulder | BUDK.com - Knives & Swords At The Lowest Prices! 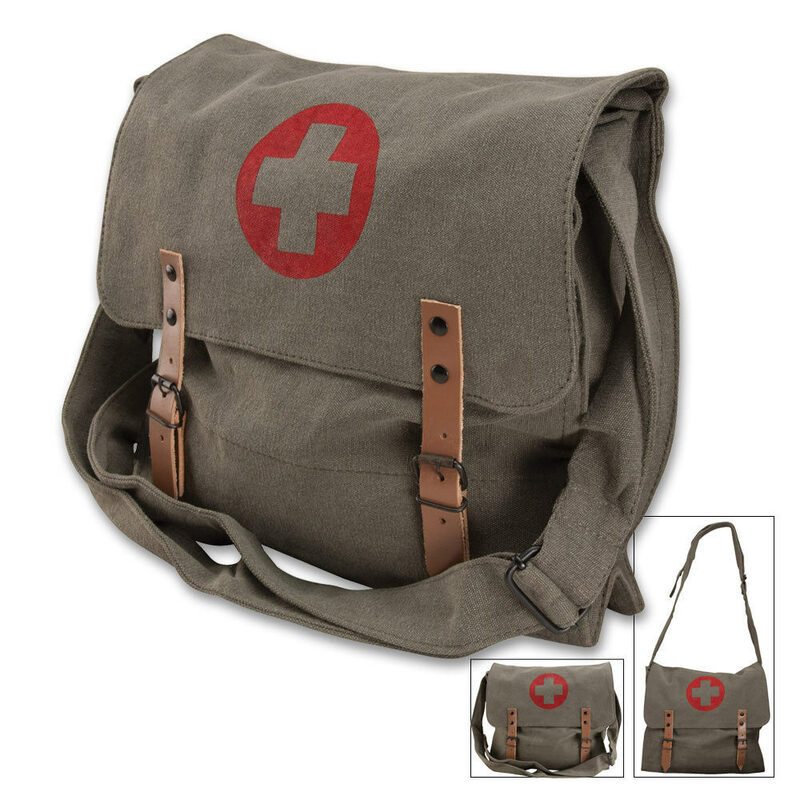 Whether you're on a day-trip hiking and camping, or just storing your home first aid kit, this classic military medic bag will get the job done. I've had this for over a year now and it's still in amazing condition! I take it everywhere (camping, hunting, etc) it's extremely durable! Perfect for keeping my first aid kit in, with plenty of room for other stuff. My son loves this bag. He keeps a first aid kit in it and it's easy to take anywhere. Along with the other reviewer (highvoltage_EMT), I'm taking EMS training classes next month, and this bag will go along nicely with keeping all the paperwork. The bag was smaller than I expected it to be (it was a little larger than a purse, I expected it to be more like a bookbag), but still really cool. I'll be sure to keep all my schoolwork as well as a small first-aid kit in there! All in all, a very nice bag! Exactly what I wanted, works perfectly for holding my books. I wish it was a little bigger but all and all it is a great buy. Just oredered this bag, hoping that it will be a good addition to my past purchases from True Swords. If not. Oh well. Doesnt hurt to give as a gift. Not a bad bag at all, just a little smaller than i imagined. But its still a good bag. Working as an EMT, it's a nice bag to carry around my laptop and show my Emergency Medical Service pride!!! everything came great only thing is that the bag is a little smaller than i thought it would be but i'm fine with that. great service from true swords! This bag is the perfect man purse! its just the right size to be carried easily, the adjustable shoulder strap is quite comfortable, just too bad it only has one pocket. Thanks true swords! awesome buy! So I got the bag today, and it's great! Exactly what I expected. Perfect size, and very nice material. The only thing that was upsetting is that it said it had two seperate pockets and it didn't, but I'm fine with that. :) The shipping was very fast as well, but it always it from Trueswords. This bag was a great buy!